It was an odd-looking bird. Its green feathers seemed borrowed from the parrot, just a shade duller. Its head was bigger, but the body smaller. It had a short tail, like that of the mynah. Its beak was also orange in colour and shaped like the mynah’s, but its big round eyes reminded Kousha of the kingfisher. He noticed that it preferred the lush tree that overlooked his backyard, not the ones a little beyond. 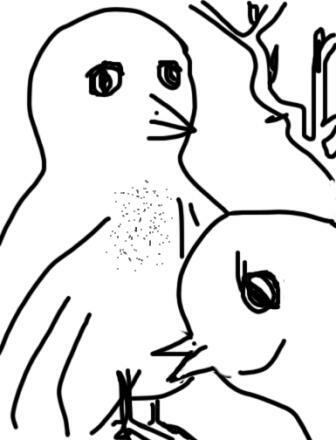 He decided to call the bird Bhuri for the spray of brown on its chest. Was it perverse logic to call a green bird brown? They had been following a routine for a month or two now. Kousha would read the morning newspaper sitting in his rocking chair in the yard, one ear cocked to catch Bhuri’s trilling notes which were a queer mix of “cheep-cheep” and “twit-twit”. He felt the bird too looked forward to his audience. Kousha even tried to imitate Bhuri when he worked in the kitchen or was lazing in his warm bathtub. He once caught a bad chill when he forgot to dry himself while attempting a “cheep-cheep, twit-twit” performance. Kousha had never seen this species of bird before. “Could it be a hybrid? A cross between a parrot and a mynah?” he muttered to himself one day as he pottered around his kitchen garden. It seemed to him a soft little twitter had been addressed to him, something that sounded like “Excuse me?” He froze, turned around slowly and found Bhuri perched on his wall. The bird could not possibly be talking to him! He felt Bhuri was looking straight into his eyes. Head bent slightly to one side, the bird appeared to be chiding him, as if offended. Kousha turned away and pretended to pull out a weed. “This is ridiculous”, he told himself softly. “Cheep-cheep?” he thought he heard it ask again. “No, I am imagining things,” Kousha thought. With measured steps he gained the door. He left it ajar, so that Bhuri should not feel he had shut it out, and peeped out. He was not quite sure, but it did appear that the bird had puffed out its chest and was strutting about on the wall. He was perplexed. He had endowed the bird with a name and now a personality. He could not help it: Bhuri acted so human. Kousha’s was the life of a hermit, almost. He kept to himself, except for occasionally visiting the departmental store. The avarice of relatives and deafening silence of the cops when his parents died in a freak accident had left him numb. He retreated into a shell after this loss. He had enough money to live on, and had found work online to keep himself busy. That way he did not need to suffer the indifferent ways of the world outside his four walls. His reclusive life eliminated any chance of a family or friends. He told himself often that he did not need company. Yet, since Bhuri’s appearance, he looked forward to its songs every morning. They were strangely soothing. It was not long before Bhuri made bold to hop about in his little garden, foraging for a hapless worm or an insect. Sometimes it would glide gently around the yard. On more than one occasion it even swooped across Kousha’s path, chirping loudly when he swore in alarm. He had a sneaky feeling Bhuri enjoyed teasing him. One morning it brought along company. There were two of them now. He spent hours watching the pair flit from branch to branch, giving each other loving nudges, chasing away any intruder that strayed into their domain. It seemed the tree was now their property. Soon Kousha figured out what they were up to. It was nesting season. They built a cosy home, smartly stacking twigs and dried leaves in a wonderful round shape to warm their eggs in. Before the eggs arrived, though, a rough storm knocked the nest off. 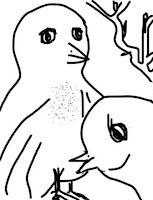 His heart wept as a listless Bhuri and its companion hopped across the branches, emitting sad little cheeps. He was astonished when they put the past behind them within hours and set about building another nest. Their resilience and determination shook him. They had taken a disaster in their stride; he had not. This forced him to think hard about the way he had allowed his life to drift. Kousha decided he would change too, but that could wait. First he had to ensure the birds were safe. He hammered a few rough shafts of wood into the wall beneath his balcony, making sure no cat could pounce on them nor a storm dislodge them. He collected a few twigs and placed them on the loft. The bird couple had been following his movements with great interest. He woke up to loud twittering in the backyard next morning. Bhuri and its companion were singing as they flew around, first arguing and then agreeing on how each twig was to be placed in their new home. They stopped mid-flight, dropped to the rafter and followed Kousha with their eyes as he walked into the yard. He could feel a distinct warmth in their gaze. As he broke into a tuneless song, they resumed their frantic chirping, failing to notice that he had shed a happy tear. He did not want his green company to fly far and wide in search of food for their nestlings. When he went to shop for grain and seeds to feed the birds with, there was a smile on his lips and a spring in his step. He hailed the man at the gate cheerfully, not in his usual grim manner. The man started in surprise, but saluted him promptly. The trips to the town library must also be resumed, he told himself firmly. The world suddenly seemed a friendlier place. A year later, Bhuri flew away with its clan, which had multiplied fast in the big tree. Kousha was no longer lonely, but he would miss the ceaseless twitters. And he owed a debt of gratitude to Bhuri. He had found his soulmate during one of his library visits, a loving wife who was going to be the mother of his child soon. the awesomest short story i have read so far!! Heartfelt thanks for the encouraging words.